Compact and convenient 5 Function Pocket Knife Multi-Function Tool... Features a miniature knife, scissors, file, tweezers, toothpick and key holder... 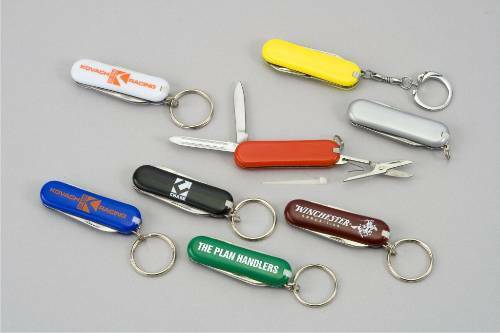 Perfect for tradeshow giveaways, camps, construction, hunting and fishing industries, travel and other uses... It is available in a variety of attractive colors such as burgundy, white, blue, yellow, orange, black and green... Eco-Friendly, made from 100% recyclable materials. 2 1/4" x 1/2" x 1/4"
• Imprint Area: 1 3/4" x 3/8"